I did not read much this month (life got too hectic!) 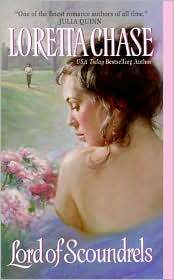 but I really enjoyed Julie Anne Long's, WHAT I DID FOR A DUKE. It was sweet, fun, poignant and I do adore older heroes! I'm reading Hoyt's, Notorious Pleasures now, hopefully I'll like it as much as you did. What an awesome reading month you had! And oh, LoS. I heart it. I do like to re-read LOS every now and then! I have Song of Seduction on my Kindle. I need to get around to it sooner rather than later. And I liked the Hoyt too. I need to write up my Phaves, don't I? I'm VERY curious about the Elizabeth Bear trilogy. I'm eagerly anticipating your review of Dust! There are other books on your list that I look forward to myself, especially the Hoyt and the Webber. I hope March is a great reading month for you. Lucy Valentine - loving that series! I think my favorite for the month was Notorious Pleasures. Really enjoying that series. Lori, I had a wonderful reading month. They don't come along too often. *g* And, sigh... LoS... I really enjoyed this re-read. Phyl this was my first re-read of LoS and I was surprised at how much I really enjoyed it. I actually went back after I finished and re-re-read those passages again, lol! Song of Seduction was a surprise. I loved the setting and the historical characters. I think you might enjoy it too. I can't wait to see which books were your Phaves for the month. Alex, yes! At least all the books were good ones this month. I must get better at juggling the work/reading/blogging schedule. I just need to get into the groove again. Christine! Thank you. I do miss you all. :( At the same time, I'm happy, lol! I'm definitely going to work on the review for Dust. I'm obsessed with that trilogy. It has been a while since I read a space opera or just plain old sci-fi (not a romance). It's just good stuff! I love Bear's creativity. Leslie, the Lofty! Song of Seduction is definitely a different historical romance (both the setting and the characters). I really enjoyed it. And lol! I'm LOVING the fact that you're enjoying Lucy Valentine too! Wow, Hils... The number might be done, which is absolutely normal considering your new job... but jeez, very, very, very high quality!! Lots of reviews I'm looking forward to. I know Song of Seduction has received raved reviews, but now you just confirm it! Can't wait to see what you thought of Welcome to Harmony. Yay, good solid reading month for you. I agree with everything you said in Lord of Scoundrels. What made me love this book and still does is the fact that Jess shoots Dain. I think I have a hidden bloodthirsty side that I only feel safe letting out in books because otherwise, I'm a real sweet person. LOL But that scene? Love it! I've tried Kathryn Shay in the past and her writing didn't work for me but I'm very intrigued by The Perfect Family (if that is the book I think it is). Can't wait for your review on that one! Nath, it was a relief to have a quality month during February. :) I think March will be a good month for reviewing so yeah... some coming up! Ames, the shooting scene in LoS did work! I'm not usually fond of those, but it worked in this book for me. :) Everything seemed to work in this book for me, lol! Oh, lots of variety in February's reading. I really liked Lord of Scoundrels, but my favourite Loretta Chase will always be Knave's Wager!